In a bleak future where flesh-eaters have inherited the Earth, one suicidal zombie slayer who lost everything joins a small-band of survivors in their quest to reach a safe-haven where no human will have to live in fear. Hunter's family is long gone, leaving only him to battle the army of walking corpses that crave human flesh. 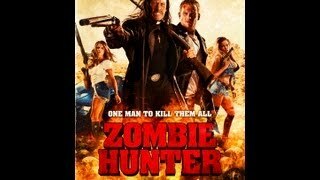 With a small arsenal and a lifetime supply of liquor stashed in the trunk of his trusty Camero, Hunter (Martin Copping) wanders the countryside on a drunken zombie killing spree. Just when Hunter is about to give up hope, however, he happens across a wandering ground led by Jesus (Danny Trejo), a blood-spattered priest who's especially handy with an axe. If Jesus can just get the group to an airplane, salvation will be just a short flight away. But now a new mutation has risen up from the ashes, and the zombies are the least of Hunter's worries. With the nightmare drawing near, this desperate group must take to the skies before they're devoured whole.